The Fall 2015 issue of the Center’s periodic newsletter, Risk Management Essentials, is now available. This edition focuses on child safety in nonprofit organizations, particularly youth-serving organizations. One of our talented summer interns, Lexie Williams, wrote the cover article on ‘Cyberbullying & Cyber Threats to Young People.’ This hot topic receives more attention daily as children and teens spend more time in the digital dimension, whether it is on computers, tablets, or phones. And while cyberbullying may not offer the warning signs we are taught to identify in cases of physical bullying, its effects can be equally damaging to both the victim and the bully. October is National Bullying Prevention Month and a perfect time to refresh your knowledge of youth protection practices. Read this Risk Management Essentials issue for insight on cyberbullying, youth protection principles, and tips for engaging parents and caregivers as essential participants in your youth protection program. Contact us at info@nonprofitrisk.org to request permission to reprint any of these articles in your nonprofit or agency’s electronic or print publication. 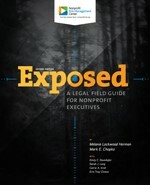 Exposed: A Legal Field Guide for Nonprofit Executives. The newly released second edition of Exposed offers insight into a variety of legal risks facing nonprofits today. Staff Screening Notebook. 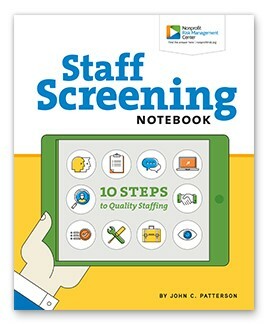 Use this easy 10-step guide to screening to find the best staff or volunteers for open positions at your nonprofit. Find the staff your mission deserves!